Once believed to be extinct and now found in only four states, the Hine’s emerald dragonfly is among the most endangered dragonflies in the United States. The largest population is found here— in Door County, Wisconsin. Through land purchases at three preserves, the Door County Land Trust recently protected 72 acres of important wetland habitat for the Hine’s emerald. The Hine’s emerald is a habitat specialist, living in areas of groundwater-fed wetlands over limestone bedrock, and is very sensitive to environmental changes. 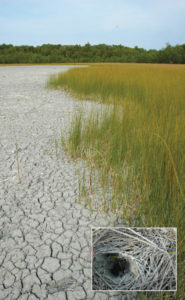 They spend up to five years in the larval or nymph stage of their life cycle in the cool, shallow, flowing water of calcareous (1) wetlands such as marshes, sedge meadows and fens. Adults live only a handful of weeks, and generally spend the majority of their time roosting and foraging in the woodlands, fields and open areas surrounding these wetlands. To survive periods of drought, Hine’s emerald dragonfly larvae often live in crayfish burrows (inset), where they try to avoid becoming a meal for their hungry roommates, the Devil crayfish. Big and Little Marsh State Natural Area during a dry summer. Top left to right: Big and Little Marsh State Natural Area during a wet season; two views of the addition at Three Springs Nature Preserve; two views of Kellner Fen Natural Area; Federally endangered Hine’s emerald dragonfly. The habitat found in Door County for this dragonfly is so important that out of a total of eleven sites in Wisconsin, the US Fish and Wildlife (USFWS) designated ten sites in Door County as “critical habitat.” These are specific geographic areas that contain features essential for the conservation of a federally endangered or threatened species and that may require special management and protection. Because the wetlands where they live are often ephemeral (2), many were filled and developed in the geographic region where the dragonfly historically lived, such as near Chicago. The most significant threats to the existence of this dragonfly species have been identified as habitat destruction and contamination. To help their chances for survival, the Door County Land Trust is working at several places to directly protect Hine’s emerald habitat as well as protect areas nearby that contribute water to feed wetlands critical for breeding and larval development. Protecting the wetlands crucial for the survival of the Hine’s emerald dragonfly also benefits our human communities by protecting the quality of our drinking water. Funding for these three recent land purchases was provided by a USFWS Endangered Species Act Section 6 Grant, WI-DNR Knowles-Nelson Stewardship Program Grant and contributions from Door County Land Trust supporters. The Door County Land Trust purchased 20 acres within Big and Little Marsh State Natural Area on Washington Island, bringing the total acres protected by the WI Department of Natural Resources (WIDNR) and Door County Land Trust at this site to approximately 373 acres. Big and Little Marsh features a complex of boreal (3) rich fen, forest and a large emergent aquatic marsh on marl (4). This newly acquired parcel provides habitat for adult Hine’s emerald dragonflies and contributes water to nearby wetlands used for breeding. The Door County Land Trust has added 12 acres to the Three Springs Nature Preserve near Sister Bay. Three Springs Creek runs through a portion of this forested wetland property that borders County Highway ZZ. When the waters are high in the spring, Three Springs Creek hosts northern pike, white suckers and other native fish. This new property buffers the area that contributes groundwater to the Hine’s emerald breeding site located nearby in the heart of the Three Springs Nature Preserve. The 40-acre addition to the Kellner Fen Natural Area near Sturgeon Bay contains boreal rich fen, open water and a cedar and hemlock forest. The fen is covered by a floating mat composed of sphagnum (5) moss and peat that supports unique, acid loving plants including pitcher plant and sundew, and a wide variety of sedges. This new addition to the preserve is part of the area designated by USFWS as “critical habitat” for the Hine’s emerald dragonfly and also contributes groundwater to the breeding habitat. (1) Calcareous means calcium-rich or growing in limestone conditions. (2) Ephemeral describes seasonal wetlands that may last for only a short period of time and leave no permanent trace. (3) Boreal describes a region that has a northern temperate climate, with cold winters and warm summers. (4) Marl is a naturally occurring fine crumbly mixture of clay and limestone, often containing shell fragments and sometimes other minerals. (5) Sphagnum is moss growing in wet acid temperate regions that decays and becomes compacted to form peat. Dragonflies play an important role in nature. They catch and eat small flying insects, including mosquitoes, biting flies, and gnats. In its immature stage (nymph), a dragonfly is an important food source for larger aquatic animals such as fish. They serve as excellent water quality watchdogs, are part of our nation’s natural heritage and add beauty to our world. Why Is The Hine’s Emerald Dragonfly Endangered? The greatest threat to the Hine’s emerald dragonfly is habitat destruction. Most of the wetland habitat that this dragonfly depends on for survival has been drained and filled to make way for urban and industrial development. Contamination of wetlands by pesticides or other pollutants also poses a threat. The dragonfly depends on pristine wetland or stream areas, with good water quality, for growth and development. Water Development that decreases the amount or quality of ground water flowing to the dragonfly’s habitat threatens its survival because it depends on spring-fed shallow water to breed.